A leave of absence is time allowed away from work for an employee to take care of an important or unusual life event. These leaves are required when the employee needs time away from work that goes beyond what is available to them in their paid vacation or sick leave allowance. The most common types of leave include: pregnancy/maternity, bereavement, family emergency, voting or jury duty. Depending on your provincial or jurisdiction, certain types of leave are paid, unpaid, or covered by Employment Insurance. Some, such as maternity leave and bereavement leave, are required under Canadian law. Be sure to review your provincial or territorial employment standards to know the minimum standards you must offer your employees. Why does Collage track employees on leave? 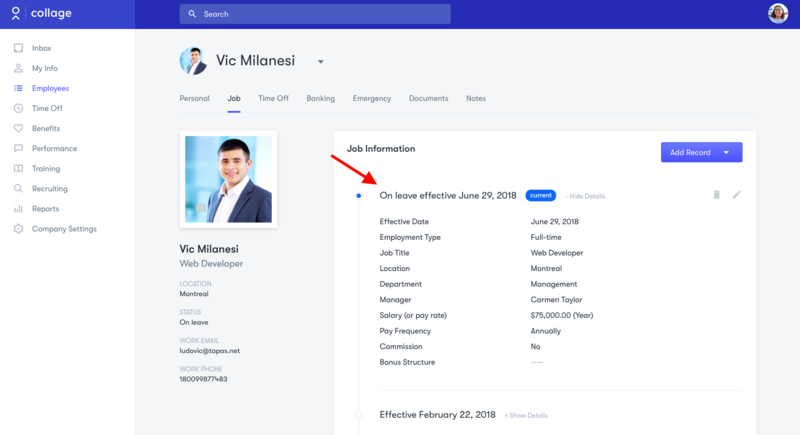 → Send an alert to your payroll department via the Payroll Updates report (if Collage is your payroll manager, we'll make the necessary changes to the employee's payroll throughout the duration of their leave). How do I place an employee on leave in Collage? 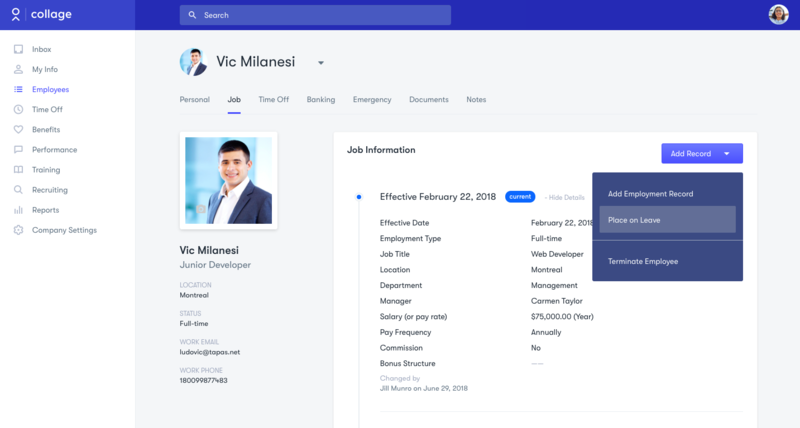 From the employee directory, search the name of the employee who has requested leave. Click on their name, then on the "Job" tab. From the employee's Job tab, click the blue "Add Record" button in the upper right corner, then "Place on Leave." Enter the leave start date, end date, and type of leave. Our drop-down menu includes the most common leave types, including Canadian government mandated leaves. You may also add a new leave type by clicking "+ add leave type" or navigating to your Company Settings page. You may edit the employee's employment details or compensation, as they relate to this leave. Changes to compensation will be automatically reflected in your Payroll report. You may also add a note describing the nature of the leave. This note will not be visible to the employee. Once you have entered the details, click save. The employee's 'on leave' status will be reflected in their Job tab as well as in the general employee directory. If you have any questions about leaves of absence, employee records, or time off management, we're here to help! Simply email your Collage account manager or click the blue chat icon on the bottom right corner of your screen.